You may have noticed by now, nearly every U.S. sales report from Audi has included the words "record" or "best-ever." In fact, this is the eighth time that Audi has broken a monthly U.S. sales record during 2010. Following in-step with last month's report, Audi is proud to announce the best-ever November in U.S. sales history. Not to mention, putting the brand on pace to set an all-time U.S. sales record for the year. HERNDON, Va., Dec 1, 2010 - Audi sustained its 2010 momentum with record-setting November U.S. sales, which surpassed the prior November record set in 2006. Leading into the close of the year, November 2010 sales of Audi cars and SUVs not only marked the eighth record month of 2010, but also comes on the heels of the best-ever October U.S. sales for new and certified pre-owned vehicles in Audi U.S. sales history. The November results keep the German luxury automaker on track to set a vehicle sales record in the U.S. by year-end. The existing annual sales record for Audi in the U.S. is 93,506 vehicles sold in 2007. 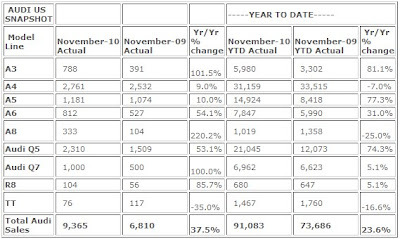 For November, Audi sold 9,365 vehicles, a 37.5% increase over the 6,810 vehicles sold in November 2009. 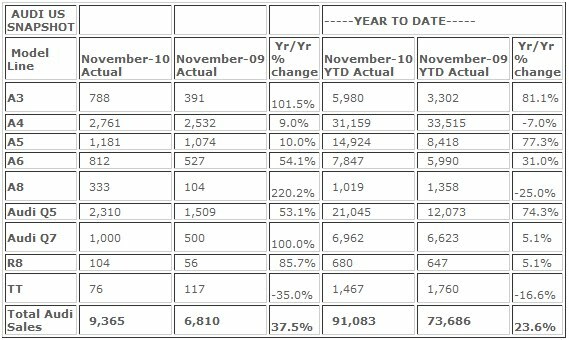 Year-to-date in November 2010 Audi new sales rose more than 20% versus its prior year-to-date total of 73,686 vehicles sold. Audi has enjoyed significant sales growth across all U.S. regions as November 2010 marks four consecutive record-setting months for sales. In particular, a new all-time Southern regional sales record has been achieved, with vehicle sales currently standing at 21,351 for the year. Additionally, November marked the debut of sales for the highly anticipated and redesigned 2011 Audi A8 flagship model – the most technologically-advanced vehicle Audi has ever produced – with 310 vehicles already sold (on top of 23 2010 Audi A8 models for the month). November 2010 Audi A3 U.S. sales not only jumped 102% over 2009 as consumers continue to demand the Audi A3 TDI clean diesel, which is the reigning 2010 Green Car of the Year, but also represent the best November for the Audi A3 in company history. Audi A3 TDI clean diesel models accounted for nearly 70% of vehicles sold in the A3 line. In addition, the Audi Q7 full-size luxury crossover sales rose by 500 units when compared to November 2009. “It is no surprise that Audi continues to remain in the coveted pole position within the luxury vehicle market with an exceptionally strong brand identity and superior vehicle offerings,” said Audi of America Chief Operating Officer Mark Del Rosso. - November 2010 ranks as the best November in Audi of America history. - Audi Southern regional sales team achieves new all-time regional sales record, surpassing previous mark set in 2007. 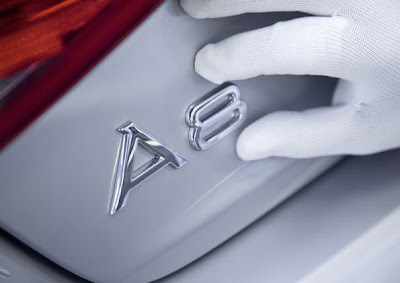 - Redesigned 2011 Audi A8 flagship sedan posts strong debut sales. - Continued high demand for Audi cars and SUVs results in only 30 days supply of in-stock vehicles. - Audi Q5 crossover sales in November second only to A4; up 53% for the month. - Audi Q7 sales doubled for November, with TDI as 45% of mix in November. - Audi A3 sales rose 102% in November; up 81% CYTD. A3 TDI is nearly 70% of mix. - Audi A5 posted record sales for the month of November. - The Audi A6 luxury sedan continued to climb: up 54% in November; up 31% CYTD. - November 2010 ranks as the second-best November ever for Audi of America CPO sales. - CPO sales experienced 44% uptick to 2,217 vehicles from 1,535 a year earlier.